If you are ready to have the lifestyle that you have always wanted, then you are in the right place! 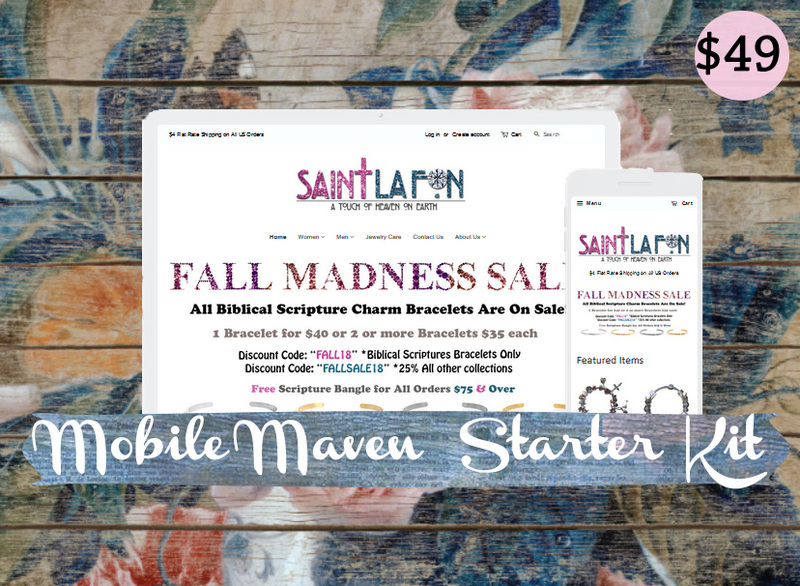 When you become an Saint LaFon Consultant, you help others tell the stories from the Bible that mean the most to them through our signature Biblical Charm Bracelets and stylish inspirational jewelry. And you get paid for it! Whether you desire to pay off debt, purchase a new home, earn extra money, replace an income, OR, you maybe looking for the freedom and flexibility that you can't get with a regular 9-to-5 job, then joining Saint LaFon could very well be the beginning of making your dreams come true! "So, where do I start?" That's simple... right here! We're ready to help you launch your new business into success! Join this month and receive FREE jewelry! Don’t Miss This Amazing Opportunity As it stands, You run your schedule and your future – Now you have the opportunity to run your own business, too! When you become a Jeweler in November, you can earn our exclusive “Saint LaFon Jewelry” look for FREE+ when you meet the qualifications! Interested... But Still Have Questions? Share your name and email below, and we will be in touch with you with more details! 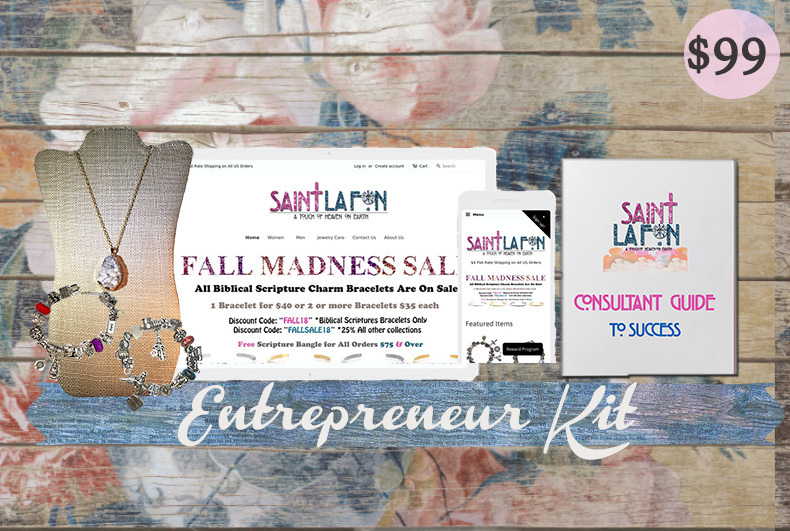 As a Saint LaFon Jeweler, YOU get to decide how to run your business! 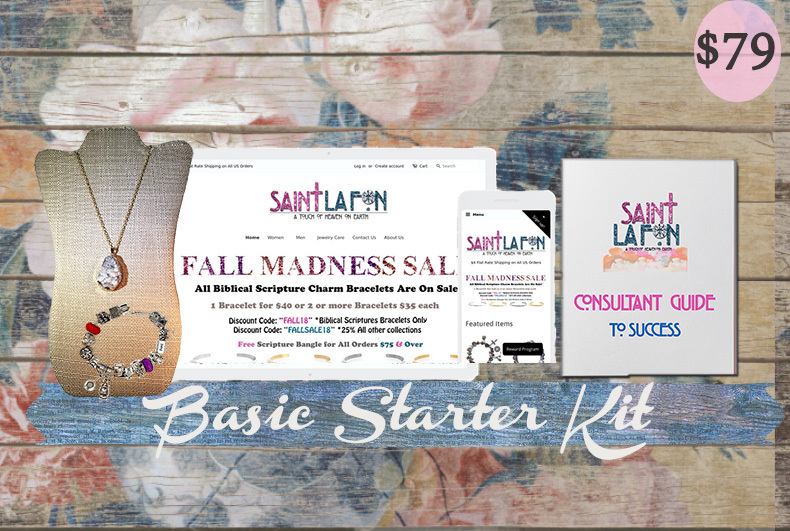 Your first step in becoming a Jeweler is to choose a business starter kit that best fits your goals! Each kit contains select pieces [including some of our newest items!] to get your new business off to an amazing start! Your own personal website for online selling success. + Free Website for 1 month optional 12.95/mo thereafter. New Jeweler Welcome Letter & Digital party planner and info binder. $25 USD in Jewelry + Saint LaFon Jeweler gift for joining. Access to the Saint LaFon online catalog. New Jeweler welcome letter, party planner and info binder. $100 USD in Jewelry + 1 Saint LaFon Jeweler charm and 1 Bracelet. Your own personal website for online selling success. + Free Website for 2 months optional 12.95/mo thereafter. $150 USD in Jewelry + 1 Saint LaFon Jeweler Charm and 1 Bracelet.